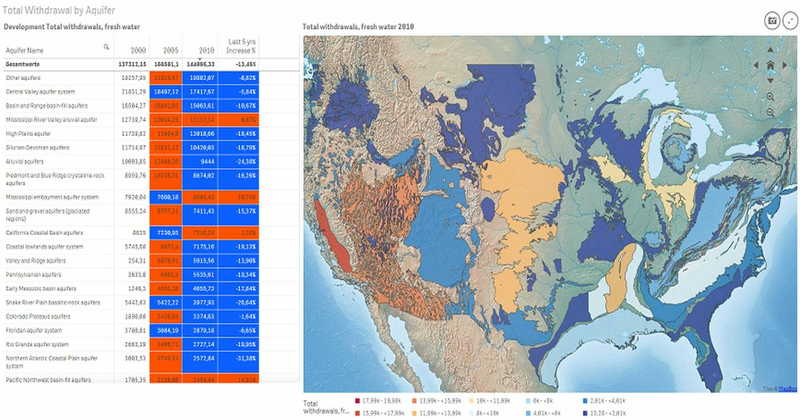 Using data to help promote water conservation. The Qlik KNOWWATER initiative continues to gain momentum and develop tools for anyone interested in researching or learning about water utilization and conservation. Qlik joined forces with Circle of Blue, Columbia Water Center and the Pacific Institute to bring together data and expertise focusing on the growing need for understanding the world’s precious water resource. Over 20 Qlik employees are now on the team. They have continued to evolve the main KNOWWATER app as well as creating a series of “snackable” apps with specific themes like the cost of water in urban settings. Qlik also hosted a Hackathon to highlight water scarcity issues at Qonnections, Qlik’s annual partner and user conference held in Orlando. Thirty participants from multiple countries formed into teams and took part in the challenge – to build an app and compete for the best visualization examples using the KNOWWATER data provided by Qlik. Teams developed apps about well changes, crop acreage impact, population growth and withdrawal statistics. The powerful and innovative visualizations from the Hackathon will be incorporated into all of the KNOWWATER apps. A preview of the app will be deployed for partners in late August with a public launch expected in September. We look forward to discussing the value of the KNOWWATER app with our partners in Stockholm at World Water Week this week and with the partner and public launch coming soon. In light of World Water Week in Stockholm, today’s post is guest-written by Qlik’s global director of CSR, Julie Whipple, and lead product manager Aran Nathanson.